Bicycle Commuter Contest: Join Us! The Olympia Intercity Transit Program’s annual Bicycle Commuter Contest calls to the community and empowers folks to use alternative transportation. In Olympia and Thurston county, the month of May is full of bicycle commuters. Folks are seen zipping around through the sunny plum blossomed adorned streets. 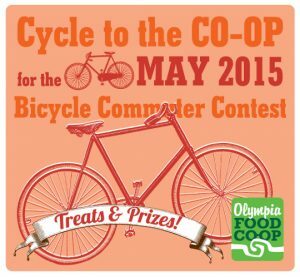 Throughout the month of May, members who ride to the Co-op receive a treat and a Ride Card. Five rides to the Co-op gets your Ride Card entered into the grand prize drawing held June 1st. Come Join the tradition and the sweet Bicycle Commuter Contest! In 2014 The Bicycle Community Contest made a huge impact!!! The Thurston County Inner City Transit came up with these numbers below. With your participation, we can do even better in 2015!